There is a bulletproof technique for operating effectively in all weathers and outdoor environments called layering. Layering is a method of dressing that helps outdoorsmen/outdoorswomen keep warm or even cool in the most extreme environments. If its a cold day on the AT or a trip around the arctic circle, layering is not only efficient but a versatile way of dressing. Closest layer to the body. This includes shirt, underwear, pants/shorts, etc. This layer sits between the base layer and outer layer. The layer farthest from the body and on top of all other layers. These layers, as well as the materials they are made of, are preforming critical jobs in an effort to shield the body from the environment. Lets explore the layers in detail and understand the importance of the materials these layers are made of. The base layer, as stated before, is the layer closest to the skin comprising of the shirt, underwear, pants/shorts, socks, etc. The function of this layer is to wick away moisture. Wicking is a very important function performed by the materials of the base layer in which the clothing pulls moisture off the skin and disperses it so that it can easily evaporate. Wicking - A material, through capillary action, absorbs moisture, such as sweat, which then travels through the material trying to find equilibrium. This equilibrium is based on the temperature and humidity on both sides of the material; inside ones shirt and the outside environment. Since the temperature and humidity inside ones shirt will be higher, the liquid will travel away from the body to find a more happier medium. Wicking will provide two very important functions. The first is the removing of moisture off the skin to keep one warm. The second is the evaporation of moisture that will keep one cool as well as dry the material allowing it to wick away even more moisture. What this all comes down to is a shirt that wicks away moisture will keep one warm without overheating their body or keep one cool without zapping away their core body temperature. In actual practice clothing will not keep up with the level of sweating one might do on a extraneous hike. The wicking property is at a constant battle of trying to grab and evaporate more moisture. Even though the material might have trouble keeping up, this is still more advantageous than a material that does not wick at all. Clothing that does not wick away moisture can be very dangerous. Wet cloths that do not wick zap core body heat leading to the reduction in effectiveness of the immune system which can compromise ones health. This can easily lead to hypothermia in compromising situations. Avoid materials that do not wick away moisture at all costs! When it comes to base layer materials there are 3 obvious choices; polyester, merino wool, and nylon. These materials have their advantages and disadvantageous. Can become foul smelling after a short time of use (oleolphic) and sometimes retains stink if not washed and dried properly. No! A cold cotton shirt will zap the heat away from the body. Cotton will keep you cold (sometimes to cold) in very hot weather but its usefulness stops there making it inflexible. You can find polyester shirts for less then $10 sometimes as low as $5, so why use cotton. Update: There are other materials to choose from that I did not list like coated polesters and blends of materials that provide wiking and odor resistance. I only listed common materials that work well for hiking. As I try more materials I will update this article. In colder situations dont forget to cover your legs. Same concepts apply. Look for wicking materials for long underwear or leggings. Polyester will be the most common type of base layer you see because of its affordability. Make no mistake, Polyester does what it needs to and does it well. Its quick dry property means it can be washed in a sink, and if hung properly, will dry overnight inside a hotel room. Polyester is a good material for a base layer. Merino wool is the rich mans base layer. It is very comfortable, great at wicking, and wont aquire a foul scent like polyester. Its also refreshing to be wearing a material that wasn't made in a lab. The only drawback to merino is its price. You can be looking to pay at least $50 for a shirt and upwards to $100. I also have had issues with quality of merino wool, sometimes only lasting a year before ripping. This is in contrast to my poly shirts that I either outgrew, lost, or accidentally burned, but never wore out. If you go with merino I suggest finding blends of merino and nylon as it will be stronger yet give all the great chracteristics of merino. I see many hikers have one merino wool shirt among their many polyester shirts just to mix around. Nylon to me is a perfect balance of polyester and merino wools strengths. It drys quick, very comfortable, and doesnt get foul scented. The only problem is nylon shirts are harder to find. You can usually find them in versatile button downs, which are great for traveling but not so comfortable for hiking. When you do find nylon shirts they are usually quite expensive. There is no perfect material. If you dont mind smelling then polester is nearly perfect. If you have the money then merino is great and comfertable option. If you dont mind looking like you are about to replace robocop on the force then nylon is awesome. Feet should be treated the same way as the rest of the body. Synthetic sock liners work well in keeping the feet from blistering but also helping to keep them dry. Pro tip: Clothing that is closer to the skin will be more effective at picking up moisture making it more efficient at keeping one comfortable. I usually dont wear tight shirts while hiking, but I am also not hiking in the Arctic circle. This is the layer that will sit between the Mid and outer layers. This layer has the simple task of insulating the bodies heat. This involves trapping air between the material creating a strong insulation for the heat coming off of the body. Efficient materials will be crucial here as they will lead to less volume and weight one will need to carry. Works mildly well when damp. Doesnt easily get a foul odor. Similar quality to wool. You might not even know the difference. Can get smelly after repeated use. Heavy as hell when wet. Sweaters can come in different blends and made out of any percentage of these materials; wool, polyester, nylon, and acrilic. All these materials are good insulators. Packs down to an unimaginable size. Very effective at keeping warm and probably most efficient on this list. Has great thermal efficiency to weight ratio. Does not work at all when wet. Might as well be wearing an ice cube jacket. Expensive as all hell but for good reason. Stuffed jackets are very similar to a down jackets but with two big differences; less expensive and not as efficient at maintaining heat. These jackets are filled with a variety of materials but usually with polyester cotton. The mid layer has many options to choose from. The down jacket is considered the holy grail in the hiking world. It excels in what hikers and trekkers want; weight, volume, and thermal efficiency. The jacket might have strong pros but it has equally strong cons. When wet the down jacket is useless, It will make you colder than if you were not wearing anything. It is also expensive and hard to maintain. If one can get around these shortcoming, using a water resistant down jacket under a quality outer layer is a good choice. Remember that a water resistant down jacket is not water proof, so do not wear it in the rain and keep it in a dry sack when not worn. 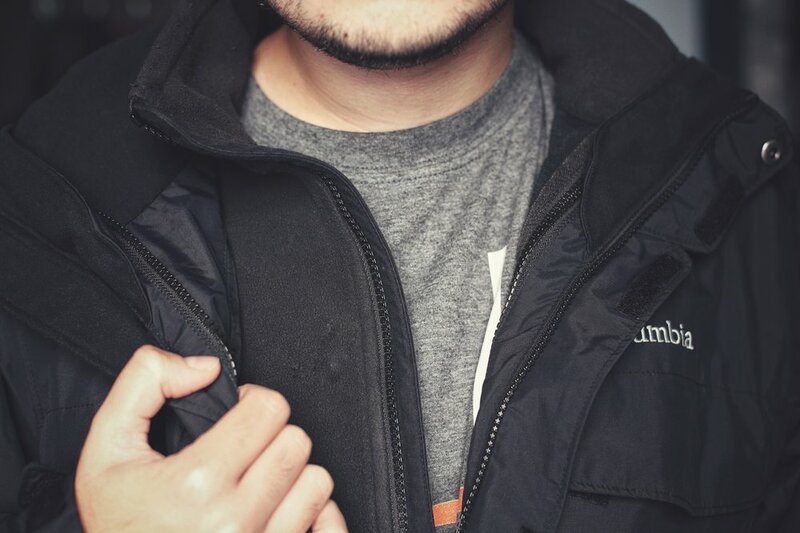 A great alternative to the down jacket is a fleece jacket. These are made of plastic (sometimes from recycled water bottles) and provide similar thermal efficiency as a down jacket. (See link here). They work well when wet and are somewhat water resistant. They also dry incredibly quick. Fleece jackets may seem thin but they do not compress well making them bulkier when packing then a down jacket. The biggest strength to the Fleece jacket, besides being a great insulator, is its price. You can usually pick one up for $20. The biggest draw back I can think of is their ability to store a static charge, especially when combined with a synthetic base layer. Sweaters can be an inexpensive option especially for new hikers. They can get the job done for the not-so-extreme conditions and usually everyone has one home or can pick one up at a local store. Just be careful and dont use a cotton sweater. Stick with wool or a synthetic blends. Do not forget about your lower body! Legs should be kept warm as well as your upper body. Leg thermals are usually made up of polyester or wool blend materials. Make sure to wear a base layer under the thermal layer. Some thermal leg options may be marketed as a wicking thermal layer which is fine in cool conditions but not suited for very cold climates. If using sock liners you will need to use a thermal layer. A thick wool sock or fleece sock works well. Of course how thick or warm the sock is dependent on the conditons outside. If the conditons are mild one could simply just use one quallity pair of hiking socks instead of a layered sock system. In more extreme colder environments make sure to insulate your neck, head, face, feet, and hands. We will go into more detail in our “How to hike in the cold using the layering system” article. If the conditions are not too extreme then packing one pair of thermal long johns or even just leggings to wear under your hiking gear will help immensely in keeping warm and shouldn't take up much volume in your pack. If the conditions are harsh then building up thermal layers may be necessary. Pro tip 1: You do not need to wear just one insulating layer. Somtimes the conditions call for multiple layers, for example, a fleece jacket under a down jacket. If you are in an environment where temperatures or your level of activity will fluctuate then stick with various light thermal layers. Pro tip 2: The colder it is the more insulating layers you might need, but be careful, if you get to hot you will sweat. Sweating will make you cold. Find a balance of warm but not hot. Control this by adding or removing layers. When it comes to materials for the insulating layer, most do not work well when wet which is where the next layer comes into play. This layer is the layer farthest from the body. Its job is to keep the elements such as wind, rain, and snow off not only the body, but the other layers as well. As stated before, moisture can be a critical factor in staying warm, so it is important to keep it away from the body and other layers. The outer layer preforms three critical tasks that keep us warm; blocks wind, prevents moisture from getting through, and lets humidity pass out of the layers. Wind is another element that can have great impact on staying warm. Wind can come in and not only cool the skin but also exchange warm air between the body and the insulating layer with cold air from the environment. This is why a shield must be enacted to protect the fragile inner layers. Outer layers are usually called shells. There are two categories of “shells”, as they are called; hard shell and soft shell. A hard shell is a jacket that is water repellent and sometimes breathable. The term breathable means that it will let water vapor, such as evaporated sweat, pass through without letting water, such as rain, in. Breathability will be important in a hard shell. This allows the wicked away and then evaporated moisture to be released from under the outer layer. A less humid environment will help your base layer be more efficient at wicking and your mid layer more efficient at insulating. Can let in moisture in heavy rain storms or when left wet for a few hours. I find nylon coating to have a shorter lifespans than gore-tex coatings. Great at resisting wind and rain even in downpours. Not breathable at all which can result in over heating and sweating. Because of this usually these have vents or cutouts in the material. Soft shell, however, is a term that loosely describes a jacket that is partially water and wind resistant and sometimes stretchable. There are many types of soft shells which makes the term soft shell hard to describe. Where softshells excel is in providing a highly breathable and stretchable jacket. If you are going to be in conditions where you need mobility, will be working hard, the weather is not extreme, and there is low chance of rain then a softshell will be a more comfortable option. These shells have the benefit of being highly breathable and flexible, perfect for aerobic activities or in situations where mobility is needed. They are usually inexpensive as they are made of polyester. Some unique soft shells are to be worn without an insulating layer and work descently wet. A soft shell like this is not to be used in extreme conditions or under freezing temperatures and is usually listed as a fall and spring jacket. Soft shells have their place but for someone looking for a shell that will keep them warm and dry in all conditions, stick with a hardshell. If you work outside in cold conditions and need the extra flexibility then I suggest trying a soft shell. Pro tip: the way the mid layer works is by trapping air between its material. Air is a descent insulator that is not only free but plentiful. Water om the other hand has a higher thermal transfer rate which means it is a low insulator. This is why all thermal layers lose effctivness when wet and why the shell layer is so important. Footwear and other parts of the body such as hands, head, and face should be treated with the same layering concepts; base, mid, and shell. Hat, gloves, and face covering should be used in harsher conditions. We cover all of this in more detail in our “How to dress in the cold using the layering system”. When it comes to footwear, there are a few options to consider. For any adventure you may be carrying different types of footwear; slippers, sandals, trail runners, hiking shoes, hiking boots, water resistant boots, climbing boots, ski boots, waders, and so on. Each case may require a different type of footwear. You need to understand what environment you will be in and what you will need Out of your footwear. You are being attacked from both sides. There is no way of avoiding moisture as it comes from the environment as well as your body. This is why a wicking base layer and water repellent and breathable outer layer is so important. Concepts such as these are often overlooked. Some might think the warmer the better, but in reality, being too hot leads to heat build up, then sweating, the inner layers getting wet, and finally those same layers sucking the heat from your body. One needs to find a balance between comfortable and warm. Two base layers do not count as a thermal layer, nor should a thermal layer be substituted for a base layer like in the case of thermal underwear. Sweat will cause the thermal layer to be less effective. Before we mentioned you can do this for mild conditions. If you dont know what conditions you will in or dont know what mild conditions are then stick with the layering system. Versatility and flexibility is why the layer system is such a powerful tool. When you feel like you are slipping away from an equilibrium temperature, you can remove or add layers. add mid layers and throw on your outer layer. remove all your mid layers and put on a breathable outer layer. then you can remove mid layers and the outer layer and let the base layer wick away the moisture. Having all three layers in your arsenal has you covered for any situation. To be clear, the word layering referes to more then just the three layers. The term layering also refers to the fact that you can add additional base, mid, and outlayers as needed. It is more advantagous to have multiple light mid layers instead of one thick mid layer. Temperatures change but the thermal properties of your layer wont. If the temperature increases 5 degrees, you can't do much about your large down jacket, but if you had multiple thinner layers, lets say a wool sweater and a thin fleece, you could remove one layer to maintain equilibrium. Even though each layer is preforming a specific action doesnt mean other layers cant be a backup. As the old saying goes “dont put all your eggs in one basket”. If you have on a quality water resistant shell layer with a down jacket underneath, I would expect that down jacket to be advertised as water repellent because of its sharp weakness to water. Internal layers can be wind resistant and breathable as well. If you will be in a worst case environment then be prepared for a worst case situation. Do not, however, rely on your base layer to be your thermal layer or your thermal layer to wick away moisture. Nor should you expect your mid layer to be your shell layer and resist wind and rain. There is no catch all material. There are key aspects to know about each layer; Base layer should wick away moisture, Mid layer should be efficient at keeping the body warm and should not be wet, and Outer layer should be water resistant and breathable. There are different materials and products, each with their disadvantages and advantages, to get the job done but it is up to the wearer to choose which he wants to don. It is important that the wearer abides by the strengths of each layer so that they can get the most out of the layering system. There is no doubt that the layering system is the most efficient way of keeping warm and one of the most versatile ways to dress in extreme conditions. From the coldest parts of Siberia to your backyard, the layering system has you covered. Keeping checking back to see when we post our next article on how to use the layering system in cold weather. You can even subscribe to our RSS feed or follow us on social media to get notified on new articles or events.